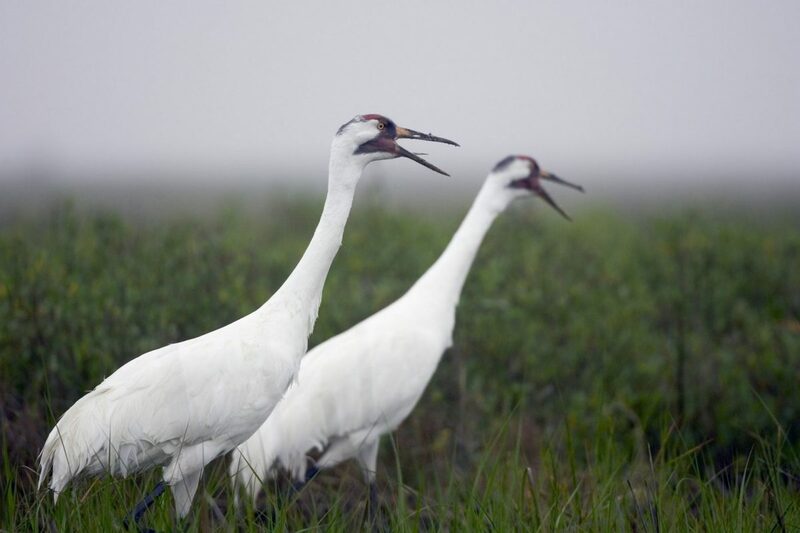 AUSTIN — Endangered whooping cranes are arriving early at Aransas National Wildlife Refuge this year. The first two birds were reported at the refuge in mid-September, and since then two more have joined them. The bulk of the whooping crane population remains north of the state at this time. The Texas Parks and Wildlife Department has developed the Texas Whooper Watch program (http://tpwd.texas.gov/whoopingcranes/) to help track the movement of these endangered birds across the state, as well as monitor whooping cranes that might spend the winter in locations not associated with the national wildlife refuge. Texas Whooper Watch is a volunteer program that is a part of TPWD’s Texas Nature Trackers program. In addition to tracking the big birds in Texas, the program will help the agency learn more about whooping cranes and their winter habitats within the state. Since beginning their slow recovery from a low of 16 birds in the 1940s, whoopers have wintered on the Texas coast on and near Aransas National Wildlife Refuge. Recently though, several groups of whooping cranes have expanded their wintering areas to include other coastal areas and some inland sites in Central Texas. This year, biologists expect the bulk of the whooping cranes to start arriving in Texas in late October or early November. Texas Whooper Watch helps improve the accuracy of surveys on the wintering grounds, as the growth of the flock has made traditional census methods more difficult. Whoopers usually follow a migratory path through North and Central Texas that includes cities such as Wichita Falls, Fort Worth, Waco, Austin, and Victoria. During migration they often pause overnight to use wetlands for roosting and agricultural fields for feeding, but seldom remain more than one night. The typical sighting (71 percent of all observations) is fewer than three birds, but last year Texas had multiple sightings of larger groups including one of 19 individuals. Whooping cranes can also be seen roosting and feeding with large flocks of smaller sandhill crane. Whoopers are the tallest birds in North America, standing nearly five feet. The cranes are solid white in color except for black wing-tips that are visible only in flight. They fly with necks and legs outstretched. Citizens can help by reporting sightings of whooping cranes and by preventing disturbance of cranes when they remain overnight at roosting and feeding locations. Sightings can be reported to [email protected] or 512-389-TXWW (8999). Observers are asked especially to note whether the cranes have colored leg bands on their legs. Volunteers interested in attending training sessions to become “Whooper Watchers” may also contact the TPWD at [email protected] or 512-389-TXWW (8999). Additional information, including photos of whooping crane look-alike species, can be found at http://tpwd.texas.gov/whoopingcranes/ and at http://www.whoopingcrane.com/report-a-sighting/.